I grow Jacob’s Cattle dried beans. I let the pods dry on the plant, snip them off when dry, dry them a few more days, then shell out the beans. Good beans are burgundy with white markings. Jacob’s Cattle beans. 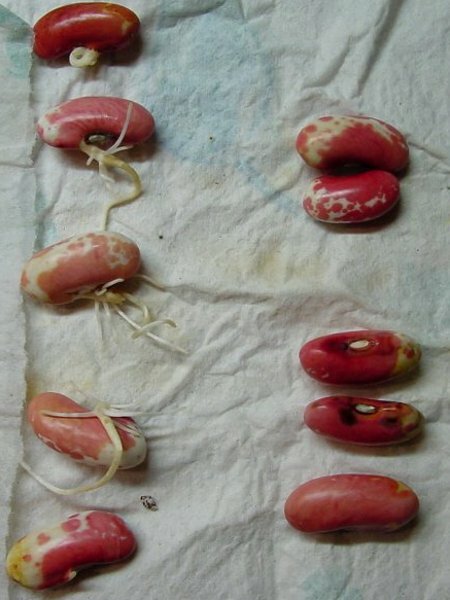 The discolored beans on top were germination tested. Jacob’s Cattle is a bush bean. There are always some pods that hang low enough to drag the ground. If it gets rainy while the beans are drying, the pods may turn black and mildewed where they touch the ground. Inside the mildewed pod, the bottom bean or two is often sprouted and moldy. I discard those. Beans higher up in the pod sometimes are discolored but without mold. The discoloration is from being partially dried, then getting damp, then drying again. 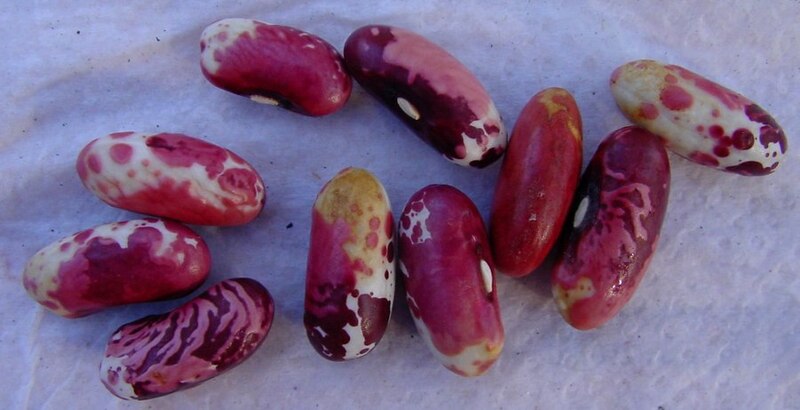 Although I don’t save them for eating, I’ve often wondered if these discolored beans could be saved as seed. Or has the dampness caused by the pod touching the ground ruined their viability? I started my germination test Nov. 11 with 10 ugly beans. 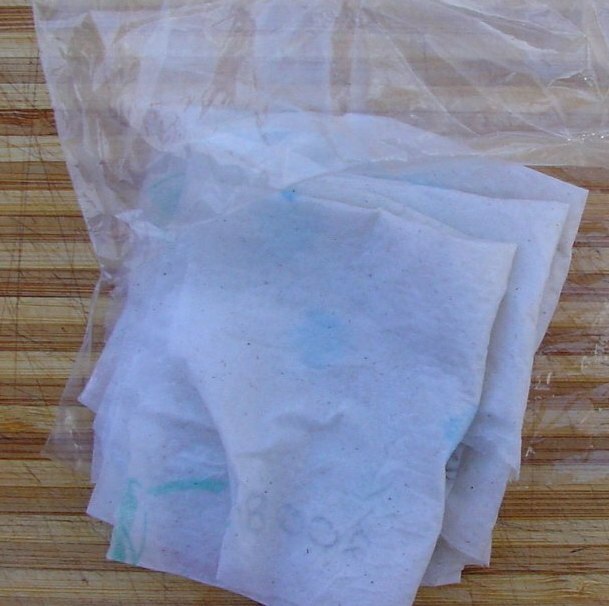 Seeds are folded in a damp paper towel and placed in a plastic bag for the test. In November I taught a class on Seeds and Transplants and in class I discussed seed germination testing. 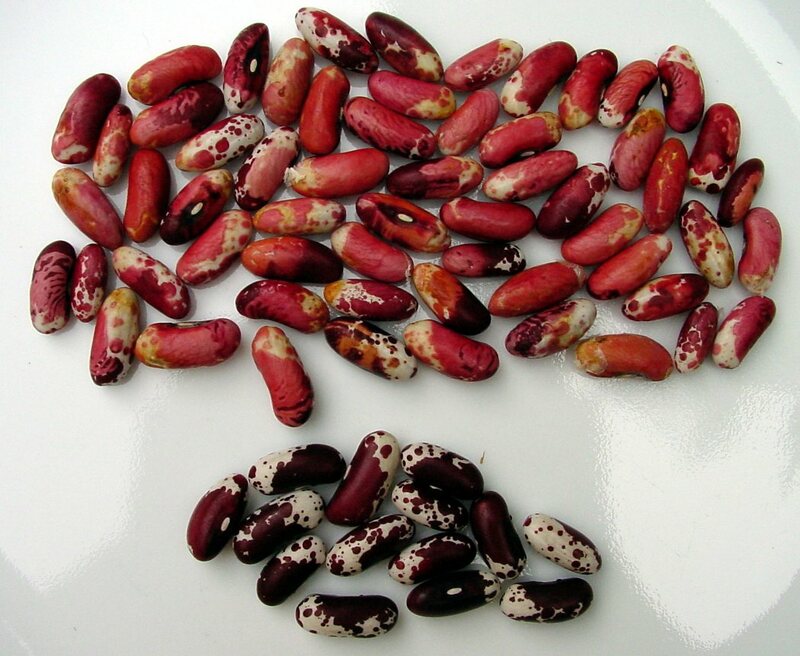 Students were asked to test the discolored seed as homework. I tested 10 of those seeds myself and 9 germinated. 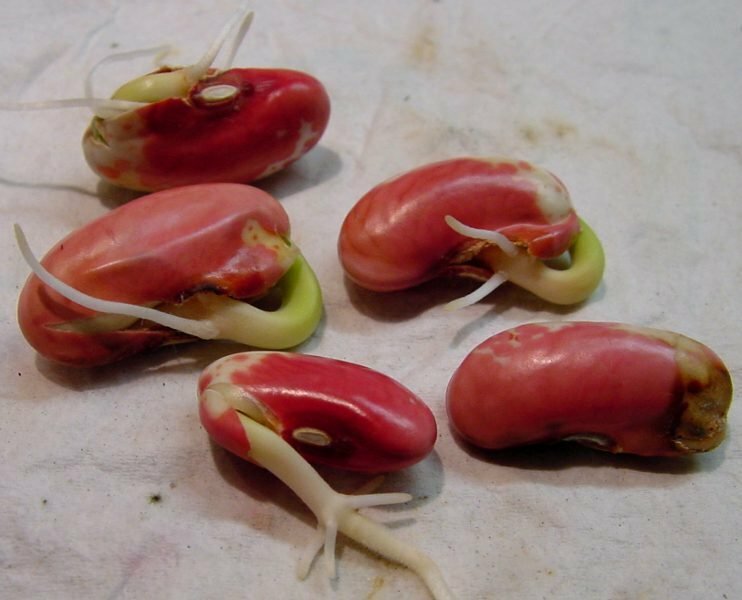 Usually beans grow quickly and five of my seeds had good-sized roots showing 6 days later. I discarded the growing seeds and put the rest back in the plastic bag for a few more days. In another 3 days four of the remaining seeds had germinated. Germination results on Nov. 17. Results: of 40 seeds tested 32 germinated. Now that I know the seed is viable, should it be used as seed stock? It doesn’t meet the standards of the seed industry – I’ve never seen discolored bean seed in a seed packet. And knowing the seed has been wet then dried, there is probably some danger of some sort of mold or mildew contamination – even if I cannot see it. You can probably tell – I’m still undecided. Nov. 17, four of the ungerminated beans in the previous photo are growing.